Much of my work is done for this year, corn still stands in the mud waiting to be picked, but other than that and cutting up this old white oak tree… I’m done 😮 This is going quite well. I haven’t had much time to work on it. The days that I did, however, have been productive. I will really miss this old tree and am thankful for the abundance she provides. Imagine the massive shade her branches made. I told my boys, that Indians probably sat under her and ate their lunch, before white men had visited this part of our state. The amount of acorns in one year were immense, just imagine if all the nut crops from all of her living years were put into a pile…it would look like a small mountain. The deer, turkey and other wildlife that benefited from her mast, span centuries. Now, even in her death, she is still giving. 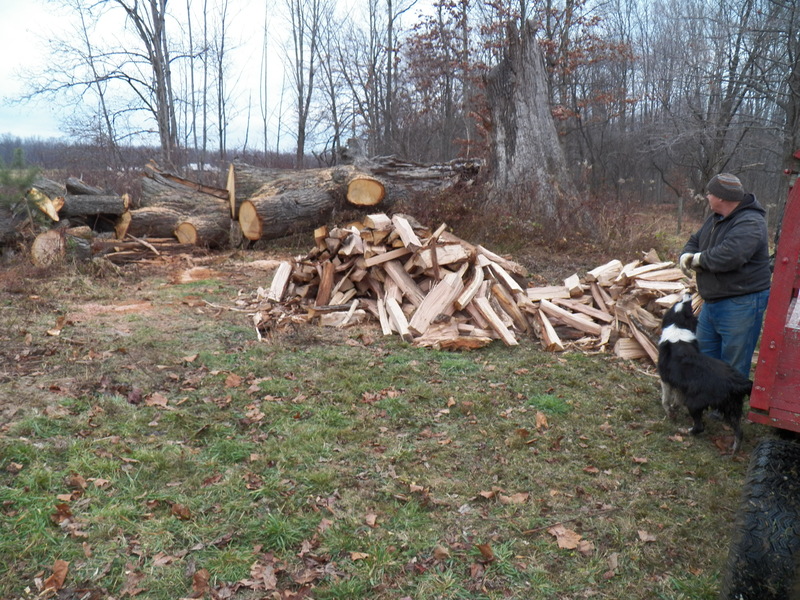 This wood will heat homes and make many gallons of maple syrup… even the ashes, swept from the spent fire will enrich the soil of our farm…. Her whole life, given for the benefit of the place where she lived. There is a lesson here. People travel the world trying to make a difference. Some folks spend huge amounts of money trying to make others or themselves happy. Others tend to live miserably, keeping to themselves always negative and unhappy. I can’t speak for others, but I choose to live like the old tree. I was born and raised in this little spot on our big planet. My travels have been few and I am okay with that. I try to give of myself, realizing that some will think I am a crazy fool, but many enjoy listening or reading about my life experiences as I share knowledge. I hope that I have sown some “acorns” along the way. I hope that I have provided comfort and safety for a few and enriched the lives of many, by just being me… That way at the end of my life, only my ashes will drift on the wind, because my memories, my hopes and my dreams will live on…. through the lives of those that I have touched… What a wonderful thing! As always Ralph, very insightful. Thank You! When we moved to this farm in 1992, one of the first things we did was stand in awe at this tree. It took 5 of us to reach around the base. I still remember holding hands as we reached around the old matron. So, all the sugarwood, is bittersweet. I consider myself planted. Thanks for sharing along the way and dropping an acorn or two my way. You are very welcome my friend! Thank you for being in my corner.